A real-life tale of intrigue and deception from a former CIA agent. When the U.S. embassy in Tehran was overrun in 1979, a small group of American employees escaped from an outlying building and took to the streets in an attempt to evade capture. Mendez (Spy Dust: Two Masters of Disguise Reveal the Tools and Operations that Helped Win the Cold War, 2002, etc.) was the CIA man who got them out of the country without being discovered. With the assistance of Baglio (The Rite: The Making of a Modern Exorcist, 2009), he tells the story of the exfiltration from beginning to end. Though no one knew about the escapees in the immediate aftermath of the hostage crisis, Mendez was actively involved in drafting a plan to free the hostages. He gives an overview of the situation from the moment students entered the embassy grounds. With plenty of background information on how the CIA practices its deception, Mendez leaves no guesswork for readers. The difficulty of operations in hostile territory is clear, as is the work that goes into disguises. Occasionally, the story slows—real spies spend much more time in the office than fictional ones—but the writing remains fresh and engaging. The Hollywood portions of the book are peppered with recognizable names and unexpected spycraft, but they are a smaller part of the narrative than the subtitle indicates. While the eventual ending is no surprise, the journey is always enjoyable. A solid choice for fans of thrillers and international intrigue. One of the most daring and courageous clandestine operations during my career involved efforts to rescue Americans taken hostage in Tehran after our embassy was seized on November 4, 1979. Six Americans managed to escape the U.S. compound and flee to the Canadian embassy, where they were hidden A very brave CIA officer, Tony Mendez, using commercial cover, entered Iran with false identities for the six and, using techniques that ought to remain secret so they can be used again, managed to get them out of Iran. This is a fascinating story about how Tony Mendez and the CIA used a bit of technical expertise and a lot of daring and courage to rescue American hostages in Iran. Tony is emblematic of the extraordinary men and women of CIA. Most of their stories cannot be told – but fortunately, in Argo, Tony has been able to lift the veil of secrecy – just a bit. Argo describes tradecraft at its best, the previously unpublished story of the courageous exfiltration of six American diplomats who had evaded capture when the American embassy in Iran was seized November 4, 1979. The development of “cover” including use of physical disguises and forged passports and documents under the direction of Tony Mendez, one of CIA’s most respected officers, made their escape possible along with critical help from Canadian diplomats. This story is true and is a must read to understand how dangerous risks have been successfully managed by men and women like Tony Mendez operating in secrecy for our protection. This true spy story has it all: guile, audacity, and bravery in a struggle with a fanatic and lethal enemy, a crucial role played by a loyal ally, and a marvelous conspiracy with Hollywood. James Bond’s Q comes to life. This gripping, true story of a white-knuckle operation by a little known part of the CIA reads like a thriller. Full of authentic detail and characters, of bravery and drama, it’s a must-read for all spy enthusiasts and CIA watchers. 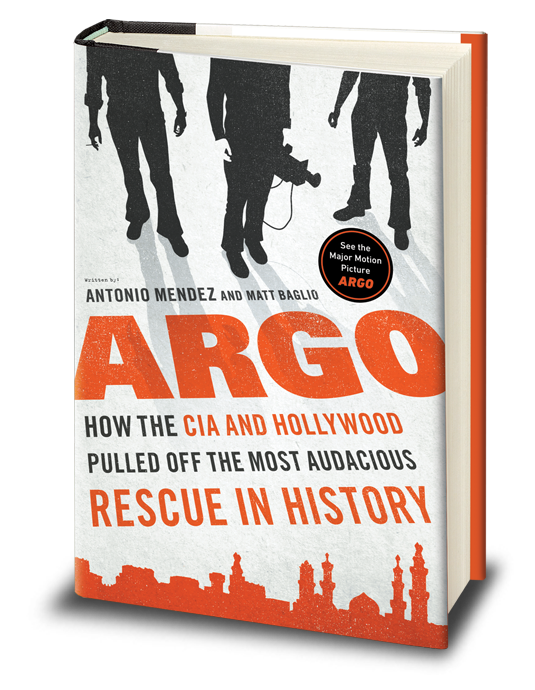 The CIA and Hollywood in cahoots, a painter turned spy, an impossible rescue mission with no guns and only one chance at success—ARGO has everything. This remarkable white-knuckle spy story is torn from the pages of real life, and will have you up past your bedtime to discover its thrilling endgame. Artist-spy Tony Mendez paints a dramatic portrait of unlikely collaborators—Hollywood, the CIA and Canada—allied in the common cause of freedom. Mendez fills Argo with the drama, pressure and tension of one of CIA’s most spectacular rescue operations. Argo is proof that espionage reality is more riveting than spy fiction. Tony Mendez is a spy’s spy. His work saved my neck on numerous occasions. I laugh quietly to myself when I watch Hollywood’s version of disguise technology in today’s spy movies—because Tony did it better. What he did in the Argo operation was spine-tingling espionage at its very best. Forget your spy novels, here’s how this stuff really works: Two secret agents quietly enter the enemy camp, unarmed but for their wit and experience. Hiding in plain sight, they rescue six virtual hostages under the eyes of their captors, a covert operation seemingly devised in Central Casting. Now their story can be told – and it makes for one hell of read.